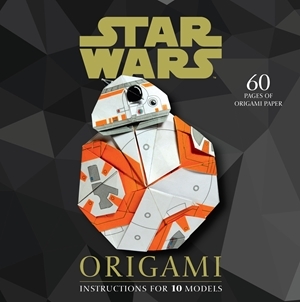 Create precision origami models of characters and ships from Star Wars: The Force Awakens with some instruction from Star Wars Origami. Comes with paper to get you started! Like a Jedi’s training, the Japanese craft origami demands dexterity and patience. Star Wars Origami takes the traditional technique and applies it to contemporary and fun projects that you can show off in your home or on your desk. Follow folding instructions on pre-printed paper to create a whole host of paper models from the major blockbuster, Star Wars: The Force Awakens. Star Wars fans will love creating 10 origami renditions of characters and ships from The Force Awakens. The step-by-step instructions make in Star Wars Origami make it easy for even beginners to this papercraft to jump in. Plus, this pack comes with 100 special, pre-printed sheets of origami paper, so your projects will have the right look, in addition to the right folds. Difficulty levels range from beginner to expert. 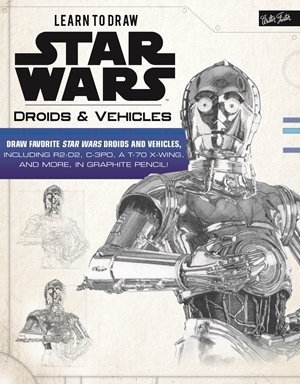 With Learn to Draw Star Wars: Droids & Vehicles, you can learn how to re-create some of the most recognizable machines in the galaxy: the protocol droid C-3PO, the astromech droid BB-8, the Millennium Falcon, and more. Inside this 128-page drawing guide, you will find step-by-step instruction on how to draw Star Wars droids, spaceships, and land transport vehicles of all shapes and sizes. Lucasfilm collaborator and professional artist Russell Walks provides easy-to-follow instructions, insightful character notes, drawing tips, and memorable moments from the films. After a brief introduction to drawing tools and materials, basic pencil techniques, shading techniques, and how to depict different textures, the book jumps right into step-by-step drawing projects. See how each drawing lesson begins with basic shapes, with each new step building upon the last, eventually progressing to a finished fine art piece. Included in Learn to Draw Star Wars: Droids & Vehicles are drawing projects for K-2SO, C-3PO, R2-D2, Luke’s X-34 Landspeeder, the Millennium Falcon, an AT-AT walker, an Imperial Probe Droid, BB-8, a First Order TIE Fighter, and a Resistance T-70 X-Wing. You can also take a closer look along with Russell Walks at how to draw Star Wars technology, R2-D2’s different tools, details of the Millennium Falcon, and the different pilot’s helmets shown throughout the saga. So grab some paper and a pencil, and get ready for your artistic journey through the Star Wars universe! 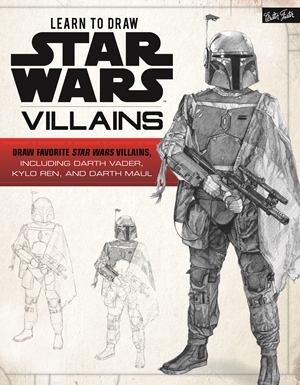 Learn to Draw Star Wars: Villains will teach you to draw your favorite villains from the Star Wars galaxy—from the lowly stormtrooper and the notorious bounty hunter Boba Fett to the infamous crime lord Jabba the Hutt and the terrifying Sith Lord Darth Vader. In this 128-page drawing guide, Lucasfilm collaborator and professional artist Russell Walks shows artists of all skill levels how to render their favoriteStar Wars villains as detailed pencil portraits. After a brief introduction to drawing tools and materials, basic pencil techniques, shading techniques, and how to depict different textures, the book dives right into step-by-step drawing projects. See how each drawing lesson begins with basic shapes, with each new step building upon the last, eventually progressing to a finished fine art piece. Experience this legendary series from a whole new perspective as you develop your drawing skills with the easy-to-follow step-by-step instructions, insightful character notes, and drawing tips. Included in Learn to Draw Star Wars: Villains are drawing projects for Darth Maul, General Grievous, Count Dooku, Emperor Palpatine (Darth Sidious), Darth Vader, Bib Fortuna, Jabba the Hutt, Boba Fett, Kylo Ren, Captain Phasma, and Supreme Leader Snoke. Russell Walks also shows how to best depict a villainous character, four ways to draw lightsabers, a comparison of Darth Vader and Kylo Ren’s masks, the differences between Jango Fett and his clone Boba, how to draw different types of stormtrooper helmets, and more. So grab your drawing pencils, and use the Force—or join the Dark Side—on your artistic journey through the Star Wars galaxy!